Dr. John D. Holmes is the director of JDH Consulting, Mentone, Victoria, Australia. He has a BSc (Eng.) from the University of Southampton, UK, and a PhD from Monash University, Australia. He is the author of more than 400 papers and reports. He received the Senior Award (A.G. Davenport Medal) from the International Association for Wind Engineering in 2011. He has been involved in the determination of design wind loads for many structures and industrial facilities, as well as the writing of several Australian Standards, and is currently the chair of the Wind Loads Subcommittee for Australia and New Zealand. "This updated edition presents in a systematic and clear way the modern scientific knowledge and methods for wind loads, discusses wind engineering topics, addresses design issues and offers ample guidance for the effective treatment of wind load design. Overall, the book provides comprehensive guidance for practising structural engineers, in particular those designing structures where the design is dominated by wind-engineering considerations, as well as for students and researchers working with analogous wind-engineering themes in advanced university courses and research." "The book gives a detailed, fundamental analysis of wind loading of structures and structural response. It clearly describes the mechanics of wind loading (including the types of windstorms) and the static and dynamic response of structures. This enables the designer to understand the process and makes it a useful design tool. With the application of the range of standards, it has worldwide application." "Holmes is an active and well-respected consultant in the field, and it is obvious that his book was written to fill the huge niche needed to treat real-world problems with wind loading on structures. For this reason it is also the first book I recommend to the many customers I have who—as practicing structural engineers not wind engineers—are in need of a comprehensive yet understandable reference text." — Daryl Boggs, CPP, Inc.
" … provides in-depth information, and work examples where appropriate, on subjects of special interest, including internal pressure, wind-borne debris and associated damages, wind load effects on special and unusual structures, application of effective static wind load distribution, and comparison of advanced wind loading codes and standards. A unique feature of this book is that it is one of the very few books on wind engineering, if not the only book, that has undergone 2 extensive revisions, first in 2007 and then in 2014, to bring the content up to date with latest advances in knowledge. Furthermore, each chapter contains an exhaustive list of references, including the most recent publications, which is an extremely useful source of information for researchers and practitioners alike. … is an excellent book on wind loading of structures. 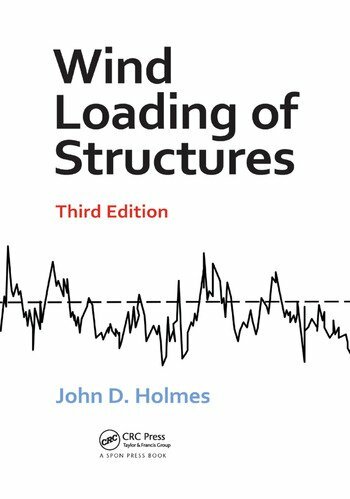 I highly recommend this book by Dr John Holmes for use in graduate and senior undergraduates studies, structural engineering design against wind actions, and other design professional practices." "The book presents a complete and deep overview of the most important aspects of wind loading. It is easily read by people with a variety of engineering or technical backgrounds. Each chapter describes the state of the art and lists foundational and actual references." "… a comprehensive and concise textbook for wind engineers … an excellent reference and textbook for graduate students, researchers and professionals." "… a book with structure and martial suitable for wind engineering course text book as well as for professionals. The area of wind engineering covered and practical examples presented makes wind engineering principles to be easily understood by structural engineers." Wind Loading of Structures is a fine text for a wind engineering course and a useful reference for the practising wind engineer…. A must have for any wind engineer's library. "The book provides comprehensive guidance for practising structural engineers … as well as for students and researchers working with analogous wind-engineering themes in advanced university courses and research."